A bald eagle soaring over Cheakamus River. Photos by Drew Levin. 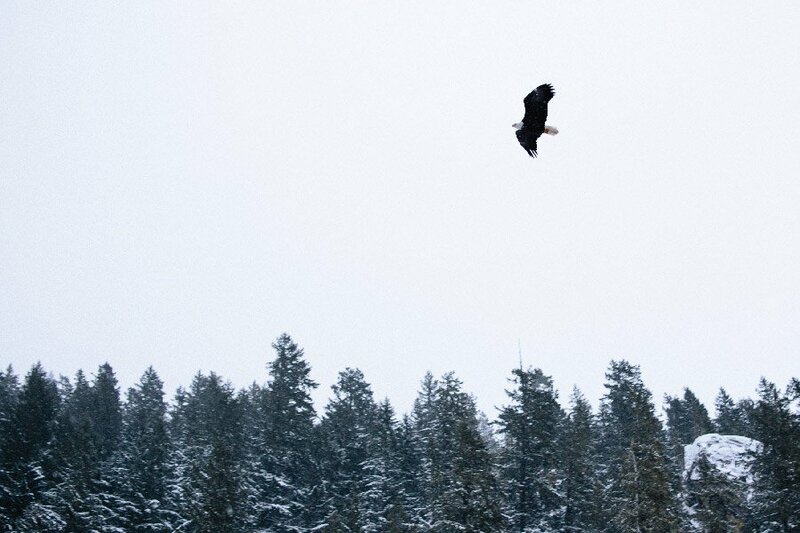 This winter, co-founder Darrell Hartman skipped the slopes in Whistler to go bird-watching in a small town less than an hour away, where more than 3,000 bald eagles kick back, spread their wings, and chow down. 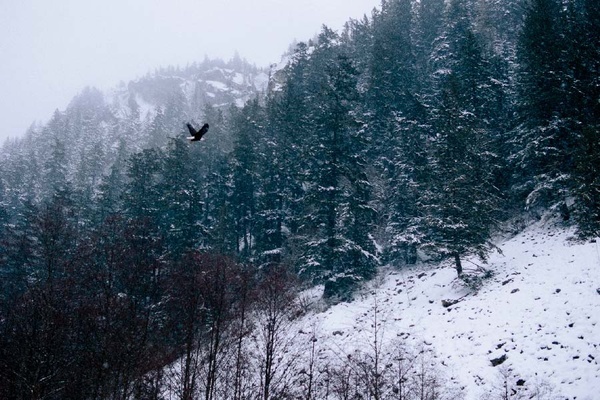 SQUAMISH, British Columbia – On any outdoorsy trip, I consider myself lucky to log an eagle sighting. But how about a place where you can spot dozens of them during a single stroll in the woods? Or even just on the drive from the airport to your hotel? Squamish, about an hour north of Vancouver, is that place. There are a few times of year where the bald eagles gather here in large numbers. One is in October. Another is from early December to early February, when the majestic birds follow migrating chum salmon up the river. Sure, it's colder, but the winter period offers the possibility of beautiful snowy backdrops, not to mention a ski vacation at nearby Whistler. But I was not in Squamish this January to hit the slopes. 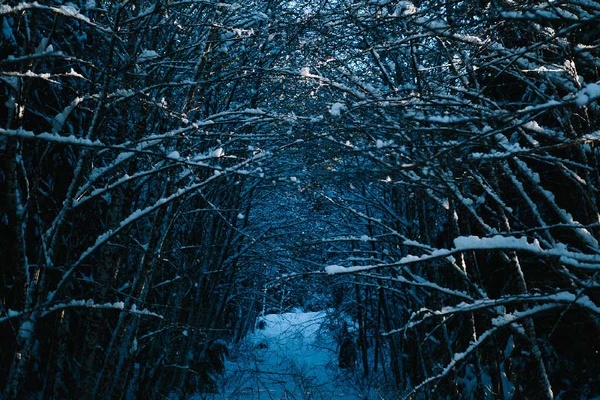 I went to shoot a short film for my company, , about the winter eagle phenomenon and the town it happens in. To be fair, it's not just Squamish. 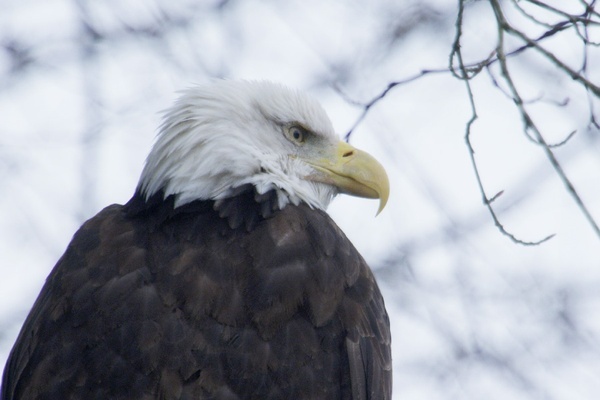 A lot of the action happens in adjacent Brackendale, which hosts a citizen-led eagle count every winter and bills itself as the Eagle Capital of the World. The moniker hails from 1994, when Brackendale's tally of 3,769 eagles surpassed the record held by Haines, Alaska. The numbers have dropped noticeably since then, which is a subject of considerable discussion and concern. To the average visitor, though, these amazing creatures still appear in ridiculous, easy-to-spot profusion. Easy eagle spotting at Cheakamus Center. And luckily for my two-man crew and me, our first full day in town coincided with that annual eagle count. (There doesn't seem to be any strict policy about visitors jumping in.) We joined a multi-generational group for a walk at , an outdoor school with an eagle-packed stretch of river and multiple spawning creeks on its property. Eagles sat perched on branches, sometimes as close as 50 feet away. We found that a handful of them might be occupying a single tree, like Christmas ornaments. And our approach did sometimes startle them into flight, which was an awe-inspiring thing to see. I forgot our total count after about ninety minutes, but it was close to a hundred. We returned happily to the cozy confines of the , which has served as eagle-count headquarters ever since its owner, Thor Froslev, helped turn an under-the-radar conservation exercise into a community event in 1986. He'd taken a reduced role in this year's eagle count, the 31st edition. Thor, who's a subject in our film, likes to call the event a barometer for what's going on in the local ecology — whose condition he thinks is being seriously damaged by commercial fish farms. He also knows the count is a great way to get people outdoors together. At 83, he doesn't get into the woods much anymore himself, but he does a swell job playing host to those who do, serving hot coffee and homemade soup when they come back to share their findings. 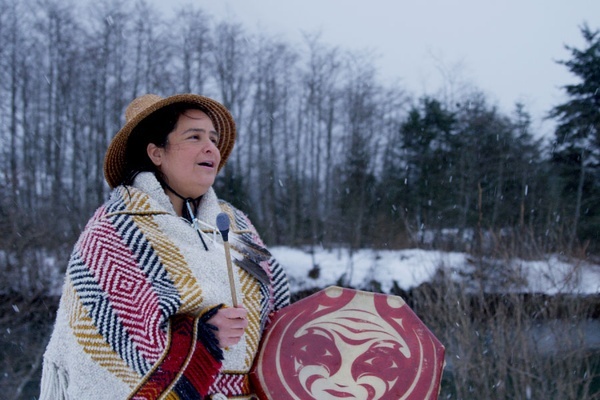 Deanna Lewis uses song and dance to pay respects to the eagle and other wildlife. More eagle spotting along Cheakamus River. Our bellies full of borscht and hearty salmon bisque, we headed down the road for an interview with someone who's got a slightly different perspective on the region's winter gathering of eagles: Deanna Lewis, a singer, teacher, and member of the Squamish nation. "The eagle flies highest in the sky," she explained, and for that reason is considered the animal in closest proximity with divinity. As a child, Deanna was taught that she was expected to give the first eagle feather she found to someone special. (She chose her grandfather.) She demonstrated how she uses song and dance to transmit respect for the eagle and other wildlife down to students. Tourism is another means of sharing her culture; Deanna guides for a First Nations-owned company called , weaves beautiful wool shawls that are available for purchase in town, and drives a mean-looking Dodge Ram pickup. She'd be a delight to have along on any tour. Exhausted from hours of filming, we went out to dinner. A snowstorm had blown in by this time, making it a muted and wintry Sunday night scene at . The food gave our three-man crew more than enough to talk about. We started with delicious beef-cheek poutine that came laced (and not just topped, as you often find) with melted cheese curd. Both my lamb shank and our cinematographer's prime rib were tumbling off the bone, and the unpretentious space — a former launderette with simple wood floors, ceiling fans, and red banquettes — invited end-of-day stretching out. We didn't need much for breakfast the next morning, when we were scheduled for a two-mile float down the Cheakamus River. Our guide was Jake Freese, owner of riverside cabins, and his wife, Vanessa. The temperature was right around freezing as we got into the raft, and the landscape was frosted in fresh snow from the before. (They were having a hell of a powder day up at Whistler.) It kept snowing, too, with great flakes adding to our shots of eagles taking off and tearing into a salmon on the riverbank. Our total count from the float was even higher than the previous day's tally at Cheakamus Centre. 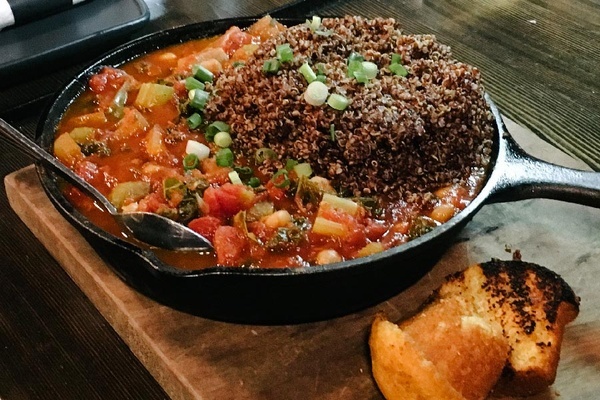 Jambalaya and quinoa at Copper Coil. The backyard at Sunwolf's Fisherman's Cottage. We’d spent the two previous nights at Executive Suites in Squamish — clean, convenient, and equipped with a hot tub. But it was nice to retreat to our light-filled, three-bedroom in the woods at Sunwolf. 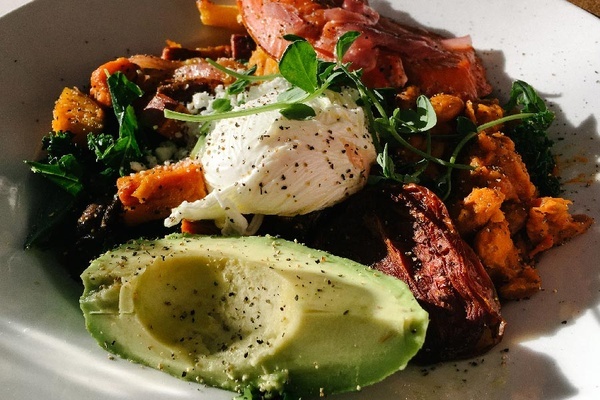 We grabbed a late lunch — hollandaise-and-poached-egg Bennies with avocado and Dubliner cheese on homemade biscuits — at the on-site cafe , then went back to Thor's gallery to do an interview. We had a gratifying sit-down with a man who had clearly found his chosen spot on earth. Thor took us on a grand tour of his bohemian compound, complete with cafe, studio, workshop, and quirky rental units. He doesn't decide how much to charge until he's learned a little about who's renting. For dinner we binged on yam fries and vegetarian jambalaya (served over hillocks of quinoa) at and celebrated our productive two days with single malt. The owner, Les, came over to chat with us, and a funny thing happened: We made him second-unit director. It turned out he had spent years as a wildlife videographer and was in possession of a new drone. He was kind enough to swing by Sunwolf the next morning and shoot some aerial footage of the Cheakamus River for us, free of charge. Canadians! After dumping his footage, we indulged in more Bennies at Sunwolf, took it easy in the afternoon, and arrived somewhat hungry at . I had loved their fruity/hoppy Skypilot Ale on a previous trip to Squamish and now got a chance to see where it comes from: a twenty-year-old brewery that's attached to a lively, giant grub hall. I took the kitchen up on a couple of its Asian-inflected menu items: mussels in lime-and-ginger coconut broth and edamame chicken pot pie. I was happy with both. At least, I think I was. For this hockey fan, the place's multi-screen NHL broadcasts were mighty distracting. I thought about Thor as we drove back to Sunwolf that night. He had left his native Denmark in 1957 and hopped off the boat in Halifax. He liked eastern Canada, but people kept telling him to head west. What first drew him to this southern pocket of British Columbia was the natural surroundings. He was a fly fisherman, particularly drawn to the beautiful rivers. His love of eagles came later. Whistler sprang up out of nothing (in the tourism sense, at least) in the 1980s; Squamish isn't all that different. The eagles go back way, way longer. They are there still. And their months-long winter meet-up is surely the best time of year to join them. is not always open to the public, so call ahead. 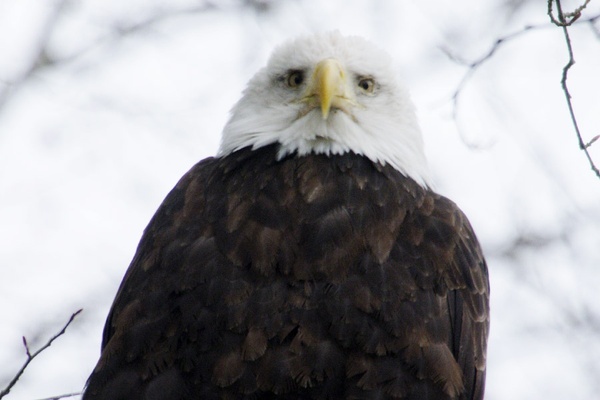 offers eagle float tours in winter.